My Creative Time: Inspire Me Tuesday! Good morning my sweet creative friends & welcome to another "Inspire Me Tuesday"! Today my awesome design team & myself made cards based on what inspired us! For my inspiration, I decided to go w/the colors I used for my new Expedit I had to get to store lots of crafty stuff I have! ;) As you can see in the picture above, I just LOVE those colors together & I thought it would be PERFECT for my card today! You can see in my video below EXACTLY how I put my card together! I actually really like how it came out! Yea!! your back to feeling great today HOORAY!! 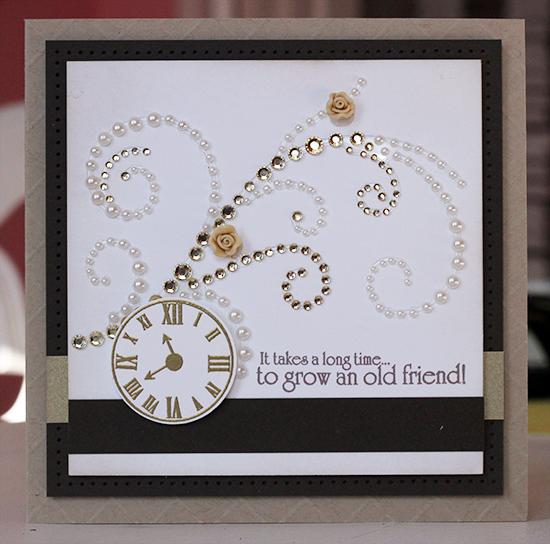 I soo loved your card the colors and how you did your background really love it and know that I can use this idea for a LO background too. I also get excited about your videos or posting because you just have so many unique and clever ideas to share and they all really expand my creative level. I love what you did to expand your craft room it's looks so awesome. Great ideas. I too love what baby Aaron did re: your Cricut cartridges he is really a smart and clever guy. I was excited when you announced that you had used your Cricut so now maybe you'll use it more now that you have it handy along with all your goodies of course. Thanks for sharing it was awesome. Hi just moi again I forgot to mention that I really love your addition of the bling and the inside of your card is really awesome too. You really made an inspiring card and whoever gets it is going to feel on top of the world. So much fun I love that color combo as well. Emma ~ Oh I LVOE your card! the colors are seriously FABULOUS! LOVE of course all the details! I must say your inspiration ~ I LOVE!! EEK! I need to get one of those things from Ikea! Thank You for sharing so many AWESOME ideas! My head is spinning! So happy you are feeling better! DT's did another AMAZING job! TRUE INSPIRATION!!!! Love all the cards from the DT. Wow, the DT has done a wonderful job! Love all the information!! Super job on your card and also your new storage space. I like to see how you change your mind and decide how to put it all together. Great running cut too. I really like what everyone did for their projects today. Great job everyone! Inspiring project today, Emma. I like how you stamped the cloud background on the 3 x 4 journal card with that Dazzle Frost ink for such a subtle look. I'm going to keep my eyes out for that ink. Awesome projects...each and every one so very pretty!!! You seriously need to come to Miami to help me with my livingroom! More amazing DT inspiration!!! LOVING everyone's fun projects and can not wait to see where their inspiration came from!